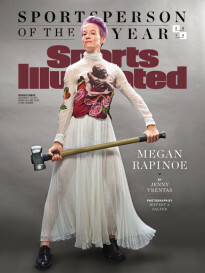 In every sport, specialists are becoming more and more prevalent, including Lacrosse. 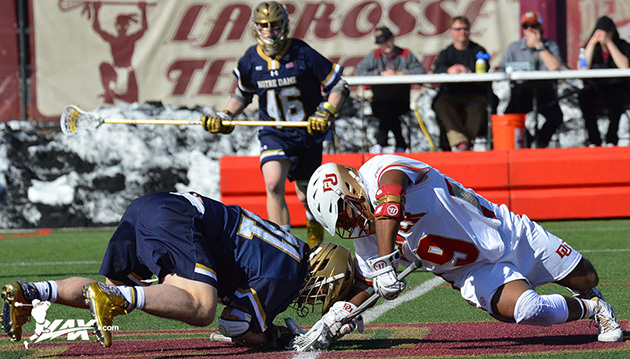 Trevor Baptiste of the University of Denver is proving that not only is the face-off specialist important, it may be be one of the most valuable in the sport. In last summer’s World Cup, Louis Van Gaal, the coach of the Netherlands, substituted his starting goalkeeper, Jasper Cillessen, in the 120th minute of their quarterfinal match against Costa Rica. With a shootout imminent, Van Gaal called on Tim Krul, a 6’4” penalty specialist, who had never played in a World Cup match. The stage wasn’t too big. Krul saved two shots in a 4-3 shootout win and clinched a spot in the semifinals for the Dutch. Van Gaal’s decision was more than just a case of obsessive tweaking. Everywhere you look it seems, sports teams are increasingly relying on specialists for specific situations. In baseball, set-up men and one-hitter relievers have become a staple of bullpens. On football rosters, long snappers are now distinguished from their fellow linemen despite only playing a handful of downs. As teams continue to try and gain an edge, a player’s value is no longer proportional to playing time. This trend has spread to the game of lacrosse and was on full display earlier this month during the University of Denver’s semifinal matchup against Villanova University in the Big East Tournament. Trevor “the Beast” Baptiste crouched down low like a wrestler at the midfield line. At the referee’s whistle he clamped the head of his stick onto the ball, pulled it away from his opponent and scooped it up. Then, after passing to a teammate, Baptiste sprinted to the sideline and another player took his place. His work was done—for now. The play lasted all of ten seconds. ​Baptiste’s supremacy centers on a single task: the draw. 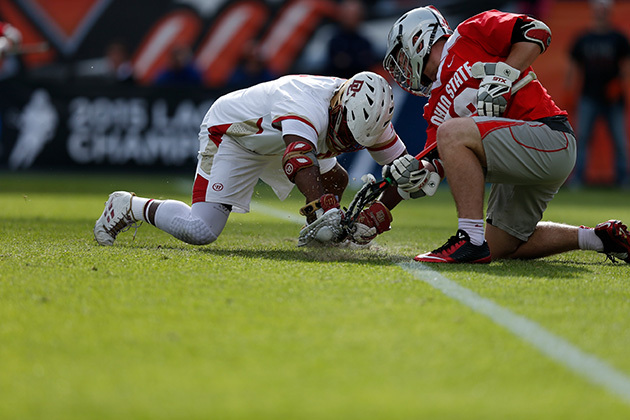 Face-offs in lacrosse occur at the center of the field at the start of each quarter and after every goal. Unlike in hockey where players who face-off also skate a full shift, lacrosse draw men are most often specialists. The position has even spawned its own acronym: FOGOs (face-off, get off). 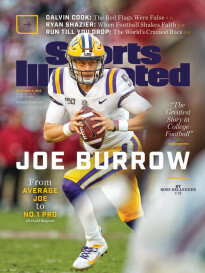 “He is like a place kicker the way he practices his skill,” Denver’s coach, Bill Tierney, said of his freshman phenom. A former junior Olympic swimmer, Baptiste first took up lacrosse in the sixth grade. He played defense. He played attack. He did not face-off. His introduction did not start until his sophomore year at Morristown-Beard high school when the player who usually took team’s draws injured his shoulder. Baptiste plunged right into his added role. He took hundreds of reps every day. He sought out Chris Mattes, a professional face-off specialist for the Florida Launch in the MLL, for individual instruction. He even made a playlist on his iPhone titled “Down, Set” with twenty whistles of different cadences to hone his reaction time when he’s practicing on his own. ​“He practiced facing-off before practice, during practice, and after practice,” says Dena Baptiste, Trevor’s mother. Heading into his senior season, Baptiste planned to attend Franklin & Marshall, a Division III program, and play regular midfield in addition to taking draws. But after winning over 85% of his face-offs to start the season, Denver came calling. Baptiste visited the campus in March. He changed his commitment to the Pioneers later that month. In his collegiate debut, Baptiste won 25 of 34 face-offs and picked up 14 ground balls in a 13–7 win against defending national champion Duke. The performance was more than beginner’s luck. He set the single regular season record for face-offs won by a freshman (259), topped all of Division I in face-off win percentage (68.6%), and on Monday helped the Pioneers claim their first national title in a 10–5 win over Maryland. ​Twenty years ago, Baptiste, who at 5’10” 215 pounds resembles a full back more than a kicker, might not have had the opportunity to turn heads. Back then, specialists were a rarity in the sport and FOGO had yet to enter the lacrosse lexicon. Face-off technicians emerged around the early 2000s. Midfielders like Chris Cercy at Syracuse and Andy Corno at Georgetown began playing abbreviated shifts and focused exclusively on taking draws. The position started to gain more notoriety in 2007 when Alex Smith, a face-off specialist for the University of Delaware who set NCAA records in face-offs won in a season and career, carried the unseeded Blue Hens on a Cinderella run to the final four. “When I played it was like lambs to the slaughter because nobody else took facing off seriously,” Smith says. Baptiste’s impact was evident in the second quarter against Villanova. Denver trailed 5–3. The Wildcats seemed poised for an upset. The younger Baptiste went 5-of-5 on face-offs in the quarter. Denver flipped their deficit into a 7–5 halftime lead. The Beast then stifled any chances of a Villanova comeback by winning 9-of-14 draws in the second half. Denver pulled away and won 16–9. ​Yet, the anatomy of a successful face-off is more intricate than a tip-off and begins before Baptiste toes the midfield line. As he makes his way out onto the field, he confers with his wingmen, usually Chris Hampton and Mike Riis. Baptiste then gives a quick glance left and right before he gets set. Sometime he motions for the wing players to shift their alignment—like Peyton Manning calling an audible. When asked about his success, Baptiste is quick to point out that a face-off is more than a one-man show. He shirks praise as fast as he reacts to the whistle. Although Baptiste said he sticks with four main moves (the “clamp,” “jam,” “razor,” and “quick rig”) there are dozens of variations. “I think of the face-off like it’s a really complicated game of rock-paper-scissors,” he says. And, like Manning, he always keeps the opponent guessing. Still, despite the acclaim and the fact that specialists are now the norm in lacrosse, some worry about being defined solely by their niche. During the fourth quarter of the Big East semifinal game, Baptiste found his opportunity to prove just that. He won the draw forward to himself then sprinted into the offense end. He absorbed a slash from a Villanova defenseman like a would-be tackler. He wound up and fired a low shot from ten yards. He scored. The goal drew the loudest cheers of the game. Leon and Dena stood and high-fived the other Denver parents. His son raised his stick above his head in a quick celebration. Then he trotted back to the face-off X.